This is a very simplified case of something we do at Spotify a lot. All user actions are logged to HDFS where we run a bunch of Hadoop jobs to transform the data. At some point we might end up with a smaller data set that we can bulk ingest into Cassandra, Postgres, or some other format. For the purpose of this exercise, we want to aggregate all streams, find the top 10 artists and then put the results into Postgres. This example is also available in examples/top_artists.py. Note that this is just a portion of the file examples/top_artists.py. In particular, Streams is defined as a Task, acting as a dependency for AggregateArtists. In addition, luigi.run() is called if the script is executed directly, allowing it to be run from the command line. There are several pieces of this snippet that deserve more explanation. Any Task may be customized by instantiating one or more Parameter objects on the class level. 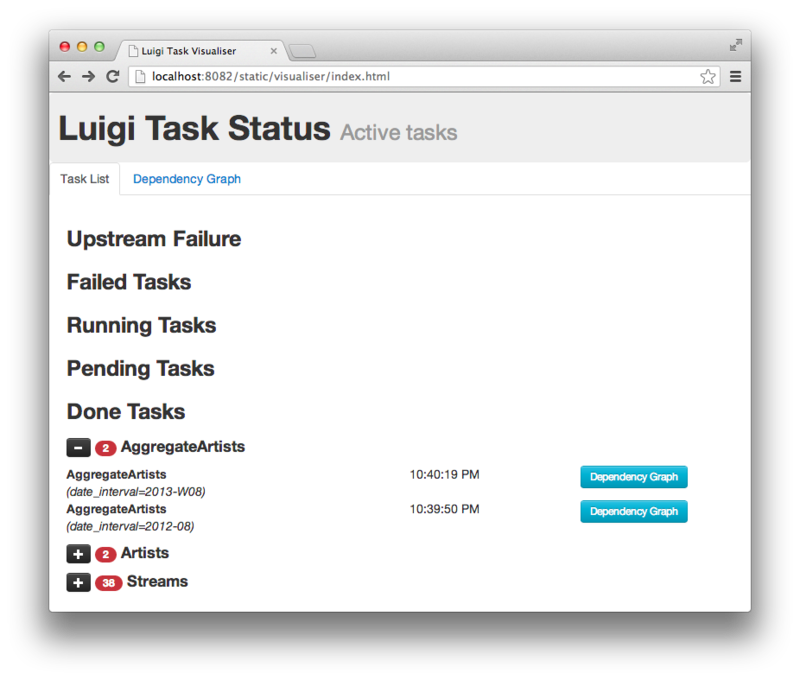 The output() method tells Luigi where the result of running the task will end up. The path can be some function of the parameters. The requires() tasks specifies other tasks that we need to perform this task. In this case it’s an external dump named Streams which takes the date as the argument. For plain Tasks, the run() method implements the task. This could be anything, including calling subprocesses, performing long running number crunching, etc. For some subclasses of Task you don’t have to implement the run method. For instance, for the JobTask subclass you implement a mapper and reducer instead. LocalTarget is a built in class that makes it easy to read/write from/to the local filesystem. It also makes all file operations atomic, which is nice in case your script crashes for any reason. Try running this using eg. You can also try to view the manual using –help which will give you an overview of the options. Running the command again will do nothing because the output file is already created. In that sense, any task in Luigi is idempotent because running it many times gives the same outcome as running it once. Note that unlike Makefile, the output will not be recreated when any of the input files is modified. You need to delete the output file manually. The –local-scheduler flag tells Luigi not to connect to a scheduler server. This is not recommended for other purpose than just testing things. Luigi comes with native Python Hadoop mapreduce support built in, and here is how this could look like, instead of the class above. 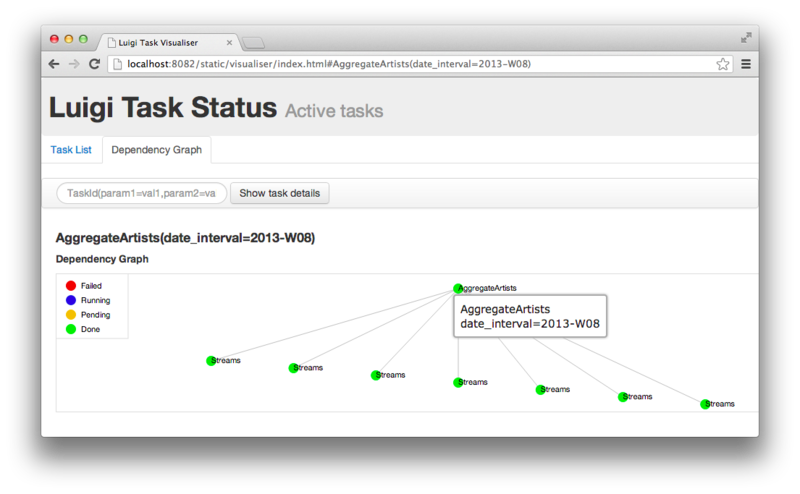 Note that luigi.contrib.hadoop.JobTask doesn’t require you to implement a run() method. Instead, you typically implement a mapper() and reducer() method. mapper and combiner require yielding tuple of only two elements: key and value. Both key and value also may be a tuple. At this point, we’ve counted the number of streams for each artists, for the full time period. We are left with a large file that contains mappings of artist -> count data, and we want to find the top 10 artists. Since we only have a few hundred thousand artists, and calculating artists is nontrivial to parallelize, we choose to do this not as a Hadoop job, but just as a plain old for-loop in Python. The most interesting thing here is that this task (Top10Artists) defines a dependency on the previous task (AggregateArtists). This means that if the output of AggregateArtists does not exist, the task will run before Top10Artists. This will run both tasks. This mainly serves as an example of a specific subclass Task that doesn’t require any code to be written. It’s also an example of how you can define task templates that you can reuse for a lot of different tasks. Just like previously, this defines a recursive dependency on the previous task. If you try to build the task, that will also trigger building all its upstream dependencies. 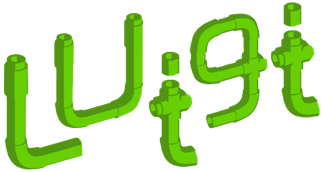 The –local-scheduler flag tells Luigi not to connect to a central scheduler. This is recommended in order to get started and or for development purposes. At the point where you start putting things in production we strongly recommend running the central scheduler server. In addition to providing locking so that the same task is not run by multiple processes at the same time, this server also provides a pretty nice visualization of your current work flow. in the background and then run your task without the --local-scheduler flag, then your script will now schedule through a centralized server. You need Tornado for this to work. In production, you’ll want to run the centralized scheduler. See: Using the Central Scheduler for more information.